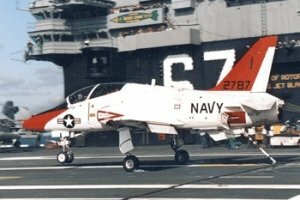 Six Hawk Mk.129 ordered in July 2003. To be used for advanced training duties by the new RBAF Flying Training School. First flight 12 September 2005. 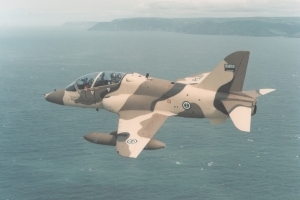 The Hawk originates from a 1964 requirement for a new RAF trainer to replace the Gnat. The two-seat Jaguar was initially intended for this role, but it was soon realised that this would be far from ideal. Accordingly, in 1968 Hawker Siddeley Aviation began the design of a much simpler strictly subsonic trainer, which it designated P.1182 (later HS.1182). The stepped cockpit, allowing the instructor in the rear seat a good forward view, was an innovation subsequently adopted by many other training aircraft. Confidence in the design was such that no prototypes or pre-production aircraft were ordered, the first six production aircraft being used for development testing. Five of these aircraft were later delivered to the RAF. 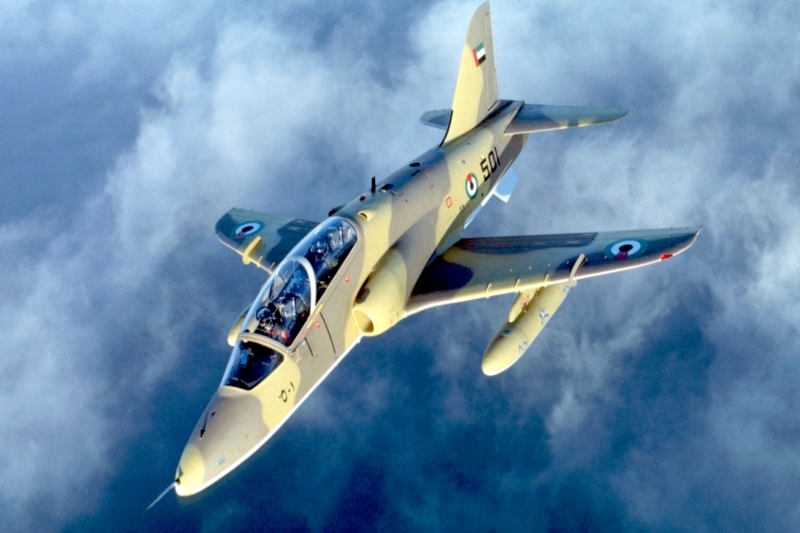 After entering RAF service in April 1976, the Hawk replaced the Gnat and Hunter in the advanced training and weapons training roles respectively. The most famous RAF operator being the ‘Red Arrows’ aerobatic team. The Hawk gained an additional role from January 1983, when modification of 88 RAF aircraft to carry Sidewinder missiles commenced. 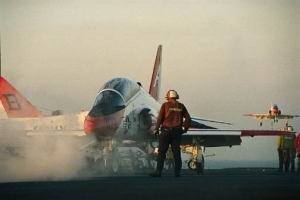 The resulting T.Mk 1A variant was intended for emergency use as a point-defence fighter, supporting Phantoms and Tornados in the UK Defence Region. These aircraft are now used as dedicated weapons trainers. The Hawk subsequently replaced the Canberra in the target towing role. 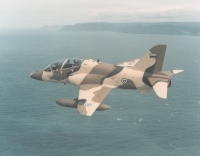 The Royal Navy also acquired a dozen Hawk T.Mk 1/1As from the RAF, for use by FRADU as aerial targets for the training of ships gunners and radar operators. From an early stage, the Hawk had aroused considerable export interest, and in 1977 the 50 series export variant was introduced. This minimum change version included provision for underwing drop tanks for the first time. In 1982 an improved export version, the 60 series was introduced, featuring an uprated engine, improved wing aerodynamics and revised wheels and tyres. Further development led to the Hawk 100 and Hawk 200 series, described separately. 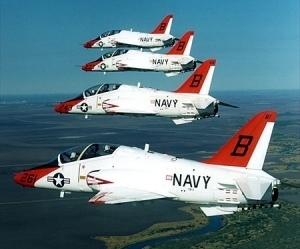 The T-45 Goshawk variant, adopted by the US Navy is also described separately. Hawk 60 series Improved export version. Uprated Mk 861 Adour engine of 5,700 lb st (25.4 kN), additional wing leading-edge fences and four-position flaps to improve lift, anti-skid brakes and revised wheels and tyres. Hawk Mk 67 Hybrid export version for South Korea. Combines a 60 series airframe with the avionics and systems of the 100 series aircraft. Equipped with ranging radar in an extended nose and nosewheel steering. * Fuselages made at Kingston upon Thames factory near London. * Very well illustrated history. * Development and operational history of the Hawk. * Very good development history up to the Hawk 200. * Modellers guide to the RAF Hawk. * Collection of colour profile drawings of the various Hawk variants. * Includes very detailed 66-page feature on the Hawk. Second prototype MRA.4 ZJ518 makes it’s first flight. Named after the ‘mighty hunter’ described in the Bible (Genesis X, 8-12) the Nimrod has successfully patrolled the seas around the British Isles for more than three decades. Successive updates have maintained the pre-eminence of the Nimrod in its primary role of hunting and killing enemy submarines, and a new upgraded version is now under development. After an abortive attempt at finding a NATO-standard Maritime Patrol Aircraft had failed in 1959, a renewed attempt to replace the Avro Shackleton in the maritime patrol role began in July 1963 when Air Staff Target (AST) 357 was issued. This called for a sophisticated medium-sized jet-powered aircraft. Proposals submitted included the HS.800, a tri-jet design based on the Hawker Siddeley Trident, but the estimated costs involved in developing such an aircraft proved much too high. This became clear in June 1964 when Air Staff Requirement (ASR) 381 was issued, calling for a much less capable aircraft which could match or exceed the performance of the French Breguet Atlantic. In an attempt to prevent the French aircraft from winning the contest, engineers at Hawker Siddeley (formerly Avro) at Chadderton came up with the idea of mating the proven Comet airframe with an under fuselage pannier similar to the one developed for the HS.800 proposal. In a very short space of time, the design office developed an unpressurised lower fuselage fairing which snugly fitted over the lower portion of the Comet fuselage, giving it a distinctive ‘double-bubble’ shape. Extending from the nose to the rear fuselage the pannier brought a dramatic increase in useable space for operational equipment and weapons while minimising additional drag. By replacing the existing Rolls-Royce Avon engines with new, less-thirsty, Spey turbofan engines a very acceptable endurance could be achieved. To keep costs down, much of the mission avionics would be similar to that already used in the Shackleton. Designated HS.801, the Comet derivative was offered to meet ASR 381 in July 1964. In February 1965 it was announced in Parliament that the HS.801 had been selected to replace the Shackleton. 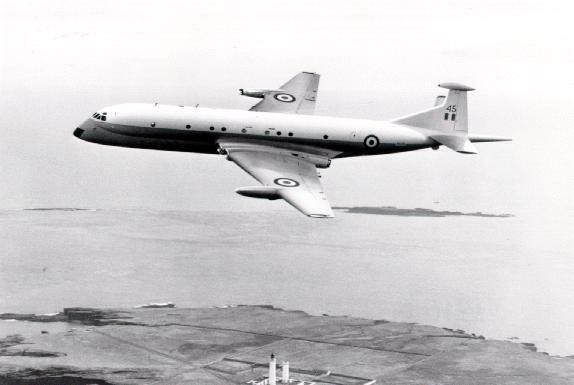 A fixed price contract for thirty eight production aircraft was agreed in January 1966, at which time the name Nimrod was selected. In the meantime the conversion of two unsold Comet 4C airframes to act as prototypes had begun. The first to fly, XV148, took the role of aerodynamic test vehicle. It was fitted with a early version of the fuselage fairing and also served to flight test the Spey engine installation. The second prototype, XV147, retained its original Avon engines to reduce risk and timescales, and assumed the role of avionics testbed. Less than a year later, on 28 June 1968, the first new-build production Nimrod MR.Mk 1 took to the air. The flight test programme was remarkably trouble free and on 2 October 1969 the RAF took delivery of its first aircraft, the Maritime Operational Conversion Unit (MOCU – later 236 OCU) at St Mawgan in Cornwall being the first to operate the type. Production aircraft were soon being delivered to operational units at RAF Kinloss, Morayshire, and at RAF St Mawgan, Cornwall. The last unit to begin re-equipping was 203 Sqn at Luqa on Malta, which received its first aircraft in October 1971. 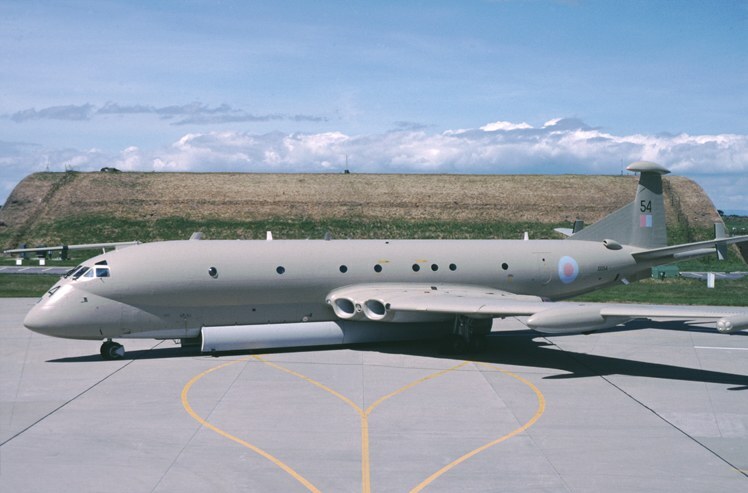 While production was getting underway, it was realised that the Nimrod airframe would make an ideal replacement for the ageing Comet 4Cs still used by the RAF for Electronic Intelligence (ELINT) duties. The Comet offered ample internal space for electronic equipment and excellent cruise performance. 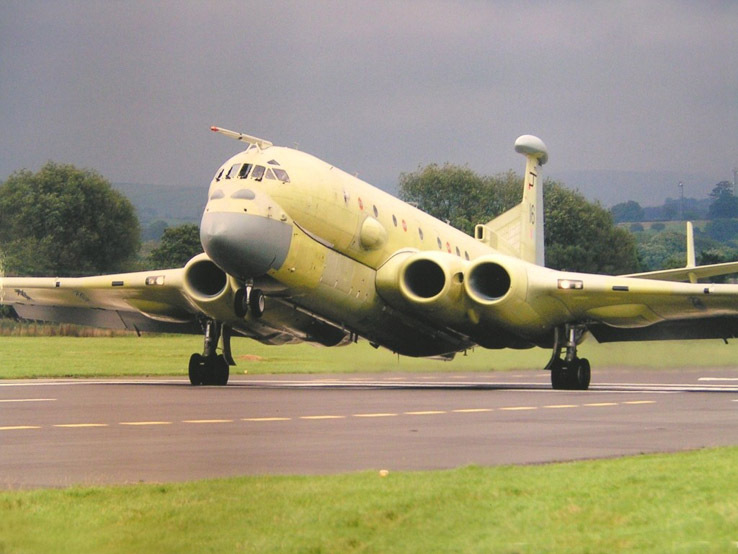 Accordingly, three additional airframes were ordered under the designation Nimrod R.Mk 1, with the first being delivered to 51 Squadron at RAF Wyton as virtually an empty shell in July 1971. Over the next three years a complex array of sophisticated electronic eavesdropping equipment was fitted to the three aircraft, resulting in a large number of antennae appearing on the fuselage. The aircraft initially only differed externally in having the MAD probe in the tail deleted and dieletric radomes in the nose of each external wing tank and in the tailcone. Over the years, the R.Mk 1 aircraft have undergone numerous equipment upgrades as electronic surveillance becomes ever more sophisticated. Some of the cabin windows have been blocked up to allow installation of more equipment, and the fuselage antennae have exhibited several changes. Around 1982 the three R.Mk 1s gained wing tip ESM (Electronic Sensing Measures) pods of a design later fitted to the AEW.Mk 3. and MR.Mk 2 variants. In 1995 R. 1 XW666 was lost in an accident after an engine fire. To replace it, MR.1 XV249 was converted to R.1 standard. The R.1 has played a low profile but key role in many conflicts, from the Falklands War to the 2003 Second Gulf War, identifying and classifying enemy air defence systems and gathering information on enemy activities. Meanwhile, an order for a second batch of eight MR.1s (bringing the total to 46) was announced in January 1972 to bring the existing Nimrod squadrons up to full strength. The 1974 defence cuts resulted in 203 Sqn being disbanded in 1977. It’s Nimrods were flown back to the UK and placed in storage. 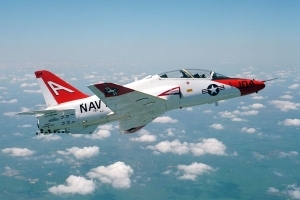 In 1975 work began on a comprehensive avionics upgrade for the MR.1. The new equipment suite included a Thorn EMI Searchwater radar in place of the aging ASV-21D unit, a new GEC Central Tactical System and the AQS-901 acoustics system compatible with the latest ‘Barra’ sonobuoys. 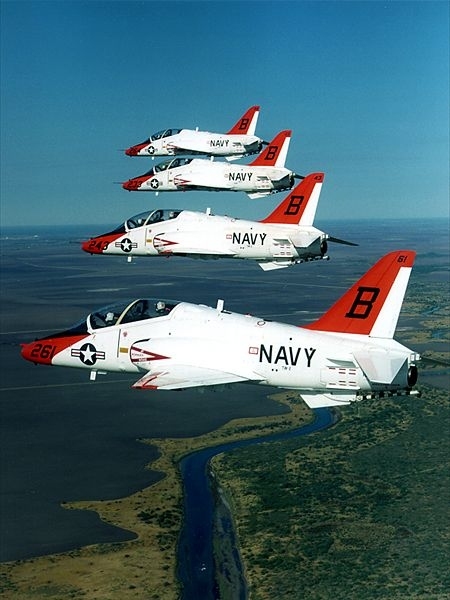 Thirty-five MR.1 were upgraded to the new MR.2 standard, with the first aircraft being redelivered to 201 Sqn on 23 August 1979. 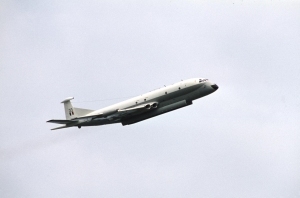 The invasion of the Falkland Islands in 1982 brought the Nimrod to public attention. Eight MR.2s were fitted with ex-Vulcan in-flight refuelling probes on the fuselage and small swept finlets on the tailplane in the space of just 18 days under the designation MR.2P. 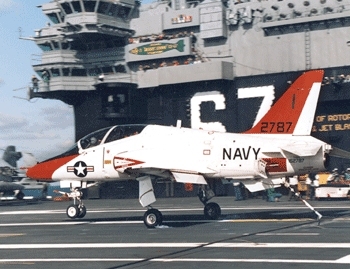 The previously unused underwing hardpoints were adapted to carry Sidewinder missiles, allowing the MR.2P to be described in the popular press as the world’s largest fighter. Patrols were flown over the south Atlantic looking for Argentine submarines and surface vessels, and also in support of British operations from Ascension Island. 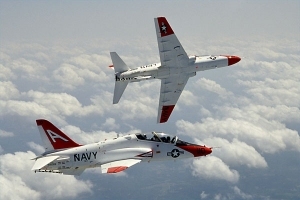 In the late 1980s, all MR.2s were fitted with new BAe designed in-flight refuelling probes. From 1985 the MR.2s began to be fitted with wingtip ESM pods, as developed for the R.1, to enhance their surveillance capability. In late 1990 several Nimrod MR.2s were fitted with an underwing FLIR turret under the starboard wing, BOZ pod under the port wing and a Towed Radar Decoy, under the unofficial designation MR.2(GM) – where GM stood for Gulf Mod. Nimrods helped to secure the Arabian Gulf sea lanes during the 1991 Gulf War and returned in 2003 to take part in the liberation of Iraq. 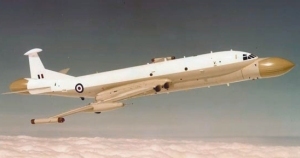 A much less successful variant of the Nimrod was the AEW.3 In 1973 the RAF had begun to examine the options for replacing the Airborne Early Warning (AEW) variant of the Shackleton operated by No.8 Squadron. 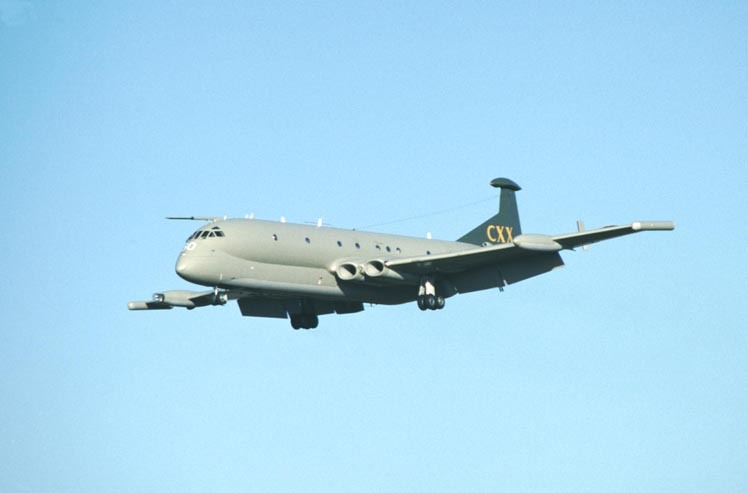 Boeing offered a variant of the successful E-3A, but the over water performance of its radar was judged to be poor and in March 1977 it was announced that a specialised version of the Nimrod, the AEW. Mk3 would be procured instead. This would be based on the Nimrod airframe but featured a large bulbous radome in the nose and a similar radome in the tail, providing 360 degree radar coverage. A weather radar was located in the starboard external fuel tank and ESM pods fitted on the wing tips. On 28 June 1977 a Comet 4C (XW626) converted to carry the nose radar unit made the first of a series of flight trials. Initial results were promising, and so 3 AEW.3 development aircraft were produced by converting redundant MR.1 airframes to carry the prototype radar equipment. The first flew on 16 July 1980. While development of the radar electronics, (and the software that controlled it), was proceeding, the Ministry of Defence (MoD) chose to impose a new and more stringent specification on the radar system. Meeting the new requirement meant a lot of redesign and retesting for British Aerospace and GEC, which inevitably delayed the planned in-service date for the aircraft. 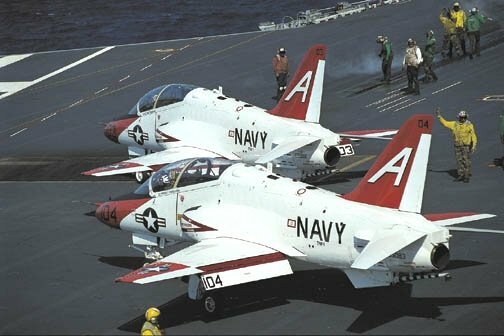 Nevertheless, in anticipation of a successful outcome of the revised system, a production batch of 8 aircraft was laid down down, using further redundant MR.1 airframes. The first example flew on 9 March 1982. By now the MoD had changed the technical specification several more times. The increased workload of trying to meet a constantly changing requirement with an extremely advanced electronics system which depended on sophisticated hardware and software was now proving to be extremely taxing task, and forecast timescales extended even further into the future. The first interim standard AEW aircraft was delivered to No.8 Sqn in 1984 to allow crew training to commence. At the same time a thorough review of the whole AEW programme was launched to determine whether a reliable and effective system could be produced and put into service. In September 1986 the AEW requirement was reopened to competing bidders and in December of that year the Boeing E-3 Sentry was declared the winner. 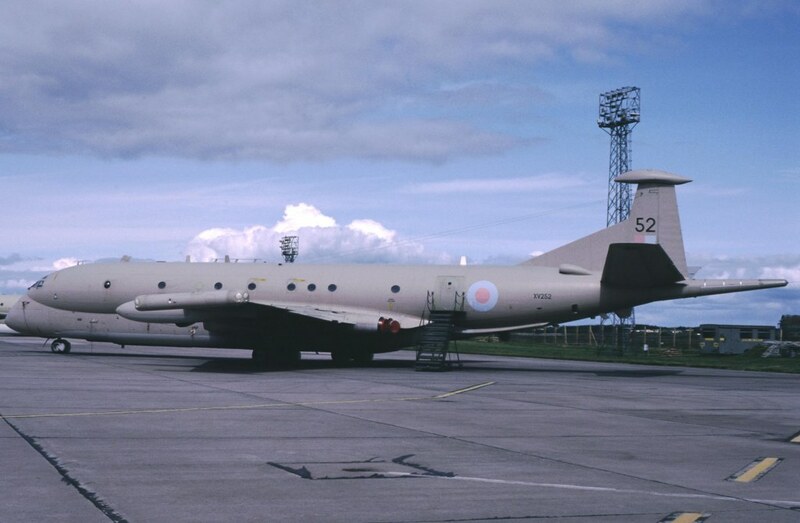 The Nimrod AEW was immediately cancelled. Unusable AEW airframes were stored at RAF Abingdon until they were scrapped in the 1990s. Poor management by the MoD had doomed a promising programme, despite the best efforts of the systems developers. In 1993 ASR420 was issued calling for a Replacement Maritime Patrol Aircraft (RPMA) for the RAF. Bids were submitted in 1995 and included a new-build version of the P-3 Orion, upgraded second-hand Orions and from BAe an upgraded version of the Nimrod MR.2 called Nimrod 2000. At the time BAe was rather short of work, and its bid was seen as a relatively low risk update which would be able to use much of the existing Nimrod training and support infrastructure. 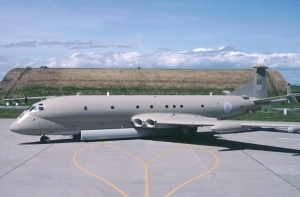 On 25 July 1996 the RMPA contract was awarded to BAe for the Nimrod 2000. Unfortunately, by this time BAe had also won several other important contracts and the staff and resources available to work on this particular project had become rather limited. With MoD agreement, the necessary work was therefore parcelled up into a number of work packages and subcontracted a number of different partner companies and also split between several different BAe sites including Woodford, Brough and Filton. 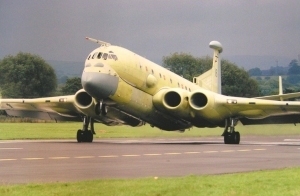 The Nimrod 2000 proposal comprised a complete strip-down and zero-life programme for the airframe, new larger wings housing Rolls-Royce BMW BR.710 engines, new radar and sensor systems and new tactical computer system. Boeing was contracted as the avionics systems integrator. 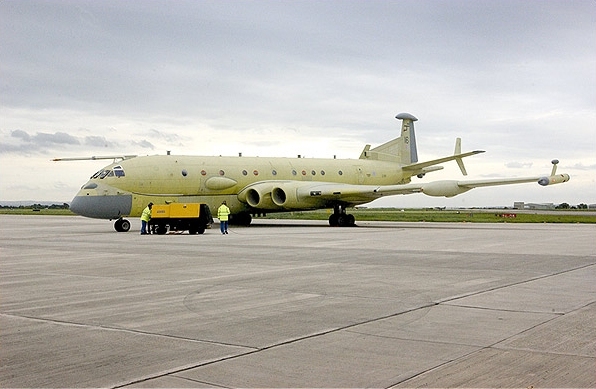 In February 1997 the first three stripped-down Nimrod fuselages were delivered to FR Aviation in Bournemouth. Due to the lack of resources at BAe and poor management oversight of the many geographically dispersed work packages, the programme soon began to run late and over budget. In 1999 Rolls-Royce were ready to deliver the first engines, but BAe had no airframes ready to accept them. A programme review in 1999 revealed that work was already running 3 years behind schedule. BAe was forced to renegotiate the contract, incurring a substantial financial penalty in the process. By now, the Nimrod 2000 name had been quietly dropped. The first reburbished airframe was returned to Woodford in January 2000. Incredibly, it took until 2003 for assembly of the first prototype MRA.4 (ZJ516) to be carried out. Unfortunately, when the second set of Airbus-build wings were offered up to the second prototype fuselage, it was found that they didn’t fit. Build tolerances acceptable in the 1960s for the fuselage were too great for the laser-precise tolerances used in the new wing. This problem highlighted BAe management’s fundamental lack of understanding of what it was they were actually trying to achieve. After an interminable amount of time performing system checks, the first prototype MRA.4 took to the air on 26 August 2004 – more than four years late. In September 2004 a round of politically inspired defence cuts resulted in the planned order for MRA.4 being reduced from 18 to ‘about 12’. Delivery of the sixth aircraft is now planned for 2009, with all aircraft likely to be based at RAF Kinloss initially. The Nimrod MRA.4 is but a crude charicature of the MR.2 that it is intended to replace, exhibiting a complete absence of the elegant blending of form and function which characterised the original 1960s design. In the same vein, the MR.2, which in 1981 was described as the most complex airborne system ever to enter service with the RAF, serves as a model of efficient project managment compared to the inept bungling exhibited by the present generation of project managers. However, despite it’s ugly appearance and late delivery, the updated Nimrod should reclaim it’s crown as the world’s leading maritime patrol aircraft. HS.801 prototypes Two Comet 4Cs converted to act as Nimrod prototypes. Ventral weapons pannier under cabin, search radar in nose, MAD stinger in tail, fin-tip radome, dorsal fin added. 1st prototype (aerodynamic testbed) with RB.163-20 Spey engines, 2nd prototype (electronic testbed) with Avon engines. Nimrod MR.Mk 1 Initial production version (38 aircraft). ASV-21D search radar, Marconi Elliott 920B central computer. Nimrod MR.Mk 1 Last 8 production aircraft (second batch) delivered with updated communications system – as later used on MR.Mk 2. Strengthened structure for gross weights of 192,000 lb (87090 kg). 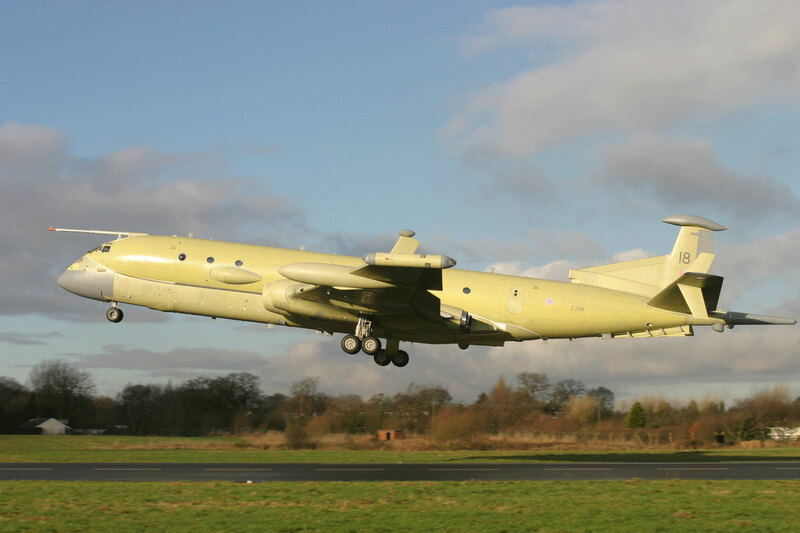 Nimrod R.Mk 1 Specialised ELINT version of MR.Mk 1 with completely new avionics fit. No MAD tailboom, no searchlight. Dielectric radomes in each external wing tank nose, numerous antenna above and below fuselage. Auxiliary fuel tanks in weapons bay. Later fitted with wingtip ESM pods and some cabin windows deleted as additional equipment fitted. Nimrod R.Mk 1P Designation applied to R.Mk 1 when fitted with in-flight refuelling probe in 1982. Small swept finlets added to tailplane. ‘P’ suffix later dropped. Nimrod MR.Mk 2 Upgraded Maritime Reconnaissance version. New avionics fit with Thorn EMI Searchwater radar, new GEC central tactical system, new AQS-901 acoustics system, new communications suite. Air scoop on port rear fuselage close to dorsal fin, for avionics cooling system. 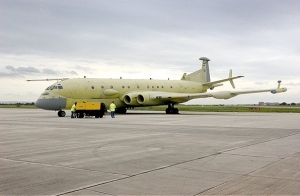 Export Nimrod Version of MR.Mk 2 offered to Canada and Australia. Strengthened structure for gross weights of 192,000 lb (87090 kg). Additional fuel tanks in weapons bay. New APU. Provision for Flight Refuelling drogue pod under each wing. Not built. 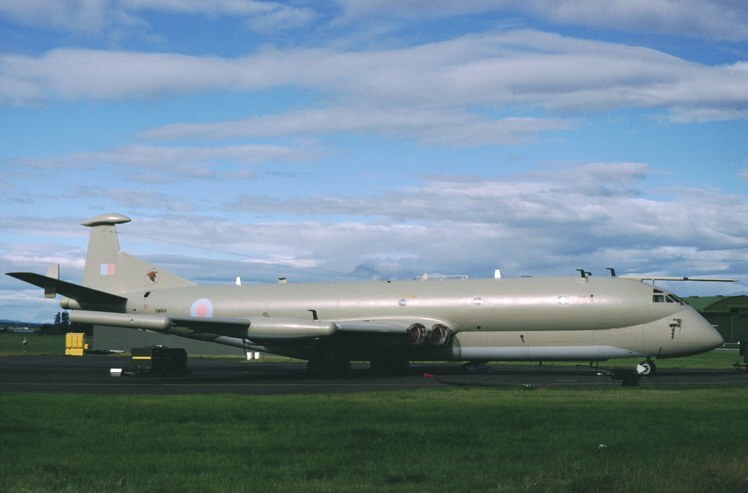 Nimrod MR.Mk 2P Designation applied to MR.Mk 2 when fitted with in-flight refuelling probe in 1982. Small swept finlets added to tailplane. Wingtip ESM pods subsequently fitted and tailplane finlets enlarged. ‘P’ suffix dropped in late 1990s. Nimrod MR.Mk 2P(GM) ‘Gulf Mod’ version tailored for use in 1991 Gulf War. Underwing FLIR turret on starboard wing, BOZ pods, Towed Radar Decoy. Nimrod AEW.Mk 3 Specialised Airborne Early Warning (AEW) version. Conversion of MR.Mk 1 with bulbous radome in nose and tailcone. Weather radar in starboard external fuel tank. ESM pods on wing tips. 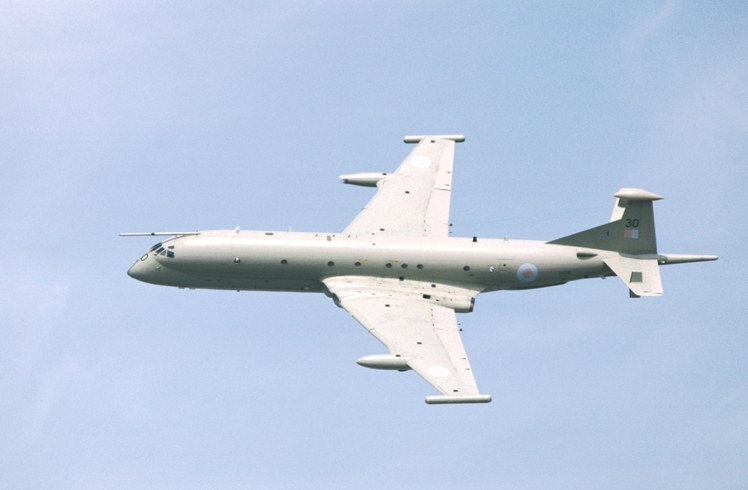 Nimrod AEW.Mk 3P Designation applied to AEW.Mk 3 XV263 when fitted with in-flight refuelling probe. Nimrod MRA.4 Significantly upgraded Maritime Reconnaissance Attack version with new larger wing, larger engine air intakes, BR710 engines, new stronger wider-track undercarriage, large tailplane finlets. Completely new mission system: Searchwater 2000MR radar, UXS503/AQS970 acoustic processor, Nighthunter IR/TV electro-optical turret under nose, EL/L-8300UK ESM suite, DASS self-protection system, advanced communication system. 2-man Airbus-style ‘glass’ cockpit. July 1963 AST 357 issued, calling for a sophisticated jet aircraft to replace the Shackleton by 1972. October 1963 Hawker Siddeley submits MR aircraft feasibility study. April 1964 Hawker Siddeley submits proposal based on HS.800 version of Trident airliner. 4 June 1964 ASR 381 issued, calling for cheaper and more rapid Shackleton replacement. June 1964 Design of HS.801 based on Comet 4 airliner begins. July 1964 HS.801 offered to meet ASR 381. February 1965 Decision to order HS.801 announced. June 1965 Hawker Siddeley receives Instruction to Proceed (ITP). January 1966 Fixed price contract placed for 38 Nimrod MR.Mk 1s. 23 May 1967 First flight of Spey-engined prototype (XV148). 31 July 1967 First flight of Avon-engined prototype (XV147). 28 June 1968 Maiden flight of first production Nimrod MR.Mk 1 (XV226). 2 October 1969 First production MR.Mk1 (XV230) delivered to RAF – 236 OCU at St Mawgan. October 1969 Order placed for 3 R.Mk 1 ELINT versions. 27 Nov 1969 RAF Strike Command absorbs Coastal Command. 7 July 1971 First R.Mk 1 (XW664) delivered to 51 Sqn as an ’empty shell’. January 1972 Second batch of 8 MR.Mk 1s announced. 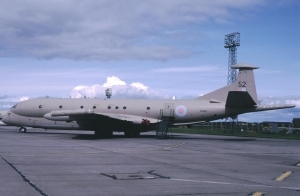 1973 Project definition for Nimrod AEW version carried out. 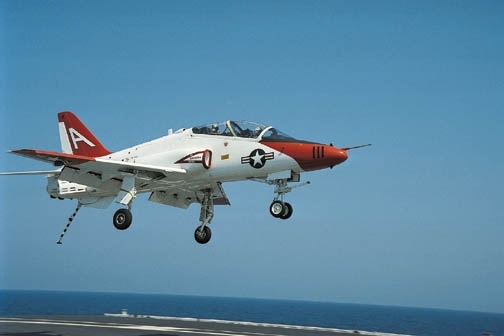 21 October 1973 Flight trials begin of mission-equipped R.Mk 1s. 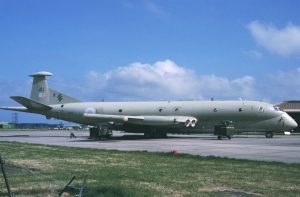 10 May 1974 51 Sqn formally commissioned with Nimrod R.Mk.1. 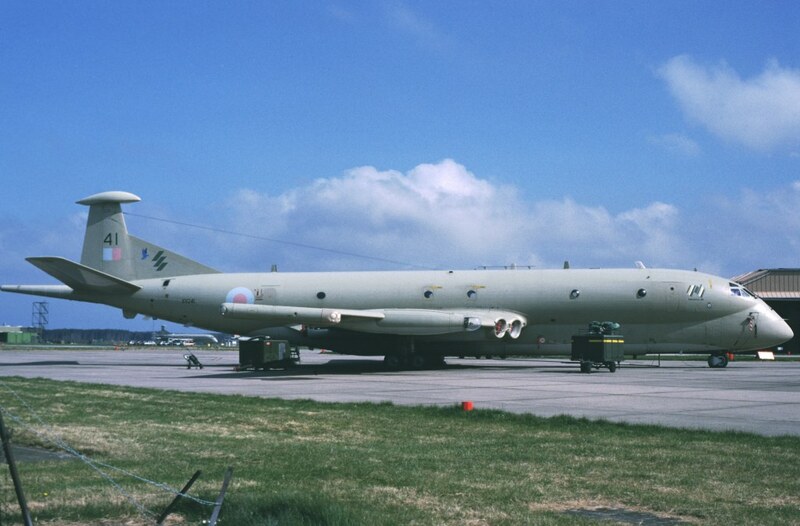 31 March 1977 Nimrod AEW chosen to meet British AEW requirement. 28 June 1977 Converted Comet 4C (XW626) begins AEW radar trials. 13 February 1979 First MR.Mk 2 production conversion first flight (XV236). 23 August 1979 Redelivery of first upgraded MR.Mk 2 to RAF. 1980 Major avionics update for R.Mk 1s carried out. 16 July 1980 First flight of first development AEW.Mk 3 (XZ286). 9 March 1982 First production AEW.Mk 3 first flight. 14 April 1982 Work starts on in-flight refuelling probe installation design for MR.Mk 2. 27 April 1982 First probe equipped MR.Mk 2P flies (XV229). 29 May 1982 First carriage of AIM-9 Sidewinder missiles (XV229). early 1982 Initial planned Nimrod AEW service entry date. Spring 1985 ESM wingtip pods introduced to MR.Mk 2. 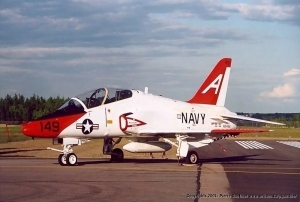 1985 Upgrade of 35 MR.1 aircraft to MR.2 standard completed. September 1986 AEW competition reopened by MoD. December 1986 E-3 Sentry selected as winner, Nimrod AEW.Mk 3 cancelled. 15 May 1995 R.Mk 1 XW666 ditches after catastrophic engine fire. April 1994 Installation of ‘Starwindow’ avionics update for R.Mk 1 commences. 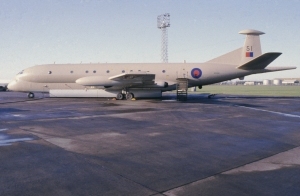 late 1998 Nimrod MRA.4 programme reviewed due to poor progress. 1999 Nimrod MRA.4 contract re-negotiated – 3 years slip in delivery to service. 1999 First BR.710-48 engine deliveries for Nimrod MRA.4. January 2000 First fuselage returned to Woodford. 19 December 2001 Electrical ‘power on’ for first MRA.4. 2002 Initial planned delivery date for MRA.4. March 2002 Engines installed in first MRA.4. February 2003 Programe restructured again – further delay to in-service date. 21 July 2004 MRA.4 order reduced to ‘about 12’. 26 August 2004 First flight of MRA.4 first prototype (ZJ516). 2009 Current forecast for MRA.4 in-service date. Performance: Maximum Speed at optimum altitude 500 kts (575 mph, 926 kph); Maximum Cruising Speed (Max Transit Speed) at optimum altitude 475 kts (547 mph, 880 kph); Economical Cruising Speed (Econ Transit Speed) at optimum altitude 425 kts (490 mph, 787 kph); Service ceiling 42,000 ft (12,800 m); Ferry Range 5,000 nm (5,758 miles, 9266 km); Maximum Endurance 15 hours 0 minutes, Typical Endurance 12 hrs 0 minutes. * With extra fuel in removable bomb-bay tanks. 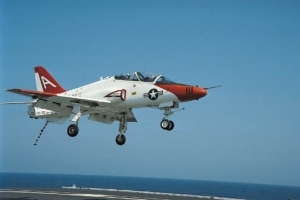 Performance: Maximum Speed at optimum altitude 500 kts (575 mph, 926 kph); Maximum Cruising Speed (Max Transit Speed) at optimum altitude 475 kts (547 mph, 880 kph); Economical Cruising Speed (Econ Transit Speed) at optimum altitude 425 kts (490 mph, 787 kph); Patrol Speed 200 kts (230 mph, 370 kph) on 2 engines; Service ceiling 42,000 ft (12,800 m); Ferry Range 5,000 nm (5,758 miles, 9266 km); Maximum Endurance 15 hours 0 minutes on internal fuel, Typical Endurance 12 hrs 0 minutes. Performance: Cruising Speed 350 mph (563 kph); Endurance 10+ hours. 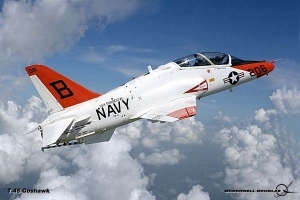 Performance: Maximum Speed Mach 0.77; Service ceiling 42,000 ft (12,800 m); Range (unrefuelled) 6,000+ nautical miles (6,909 miles, 11,119 km); Endurance 14+ hours. * later British Aerospace, then BAE SYSTEMS. * Complete history of the Nimrod up until 1985. * Concise pictorial history of the Comet and Nimrod in well captioned b+w photos. * History of the Nimrod up until 1986. * History of the Nimrod up until 1994.